Channel 4's often controversial soap Brookside has ended after 21 years. The final episode of the show, based in a Liverpool close, was broadcast on Tuesday. Channel 4 announced the end of the series in June. The show - which at its peak had audiences of eight million - was moved from its peak-time slot last year after its ratings slumped to 1.5 million. "It touched upon issues that affected people in their real lives," actor Dean Sullivan (Jimmy Corkhill) said. The soap, which began in 1982 as part of the newly launched Channel 4, was devised by producer Phil Redmond. In the final episode, drug dealer Jack Michaelson, played by Paul Duckworth, was hanged from his own bedroom window. The lynch mob, who had all been wronged by Michaelson in recent weeks, included Jimmy Corkhill, Steve and Marty Murray, Tim O'Leary and Sean Smith. The plot details for the finale were kept secret prior to screening, but featured old characters Lindsey Corkhill (Claire Sweeney) and villain Barry Grant (Paul Usher). Mr Redmond, who directed the last episode, praised fans who had stuck with the show. "I'd like to thank them for sticking with the show, especially in its later days when it was being moved around the schedules," he said. "With the last episode, I'm saying 'This is just for you, guys'." The long-running soap has received several tributes. "Brookside has been a fantastically creative and brilliant programme for Channel 4, pioneering dramatic and cutting-edge storylines," said Channel 4 chief executive Mark Thompson. "I'd like to thank everyone at Mersey Television who has been involved in bringing Brookside to the channel, especially Phil Redmond who has consistently driven the series with a passion," he said. Mr Redmond's Mersey TV, which made the soap, is now beginning work on a daily courtroom drama for the channel. 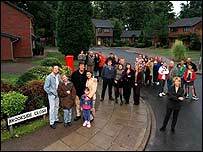 Brookside was shot on a real close which the producers had bought, in an effort to make the show more realistic. The show also prided itself on its gritty storylines. Over the years the show has featured actors such as Ricky Tomlinson, star of The Royle Family, and Anna Friel. Brookside got its highest viewing figures for a 1985 storyline where psychopathic gunman John Clarke terrorized the close, taking three people hostage before he shot himself. In the early 90s the show became known for its controversial storylines, which included a lesbian kiss between Beth Jordache (Friel) and Margaret Clemence. Mr Redmond said he wanted the show to live on and planned to release episodes on DVD three or four times a year.